I think I have a thyroid problem? Thyroid illness, hypothyroidism is an autoimmune disease. It was the first disease to be recognized as an autoimmune disease. It was first described by Hakaru Hashimoto in Germany in 1912 and we have been seeking a cure and better treatment ever since! Hashimoto’s antibodies slowly destroy the thyroid gland with an autoimmune attack. Your thyroid may try to fight back and have a final effort at working and this can then lead you to have the reverse problem of the symptoms of hyperthyroidism such as panic attacks and heart palpitations. Finally your hormones also play an important part in this balance and need to be assessed and corrected too. Eventually, like me, your thyroid gland stops working which leaves you feeling ill and totally hypothyroid. There are so many that you need a whole check list but to start you off here is a great picture. Sorry it’s a picture of a woman as we know guys get this illness too! Then check out this link to a list you can print offand take with you to your Doctor. You may get T4 and T3 and I will explain more later on. Adrenals very hard to get on the NHS and I can recommend a private clinic that does saliva testing for you. Reproductive Hormones. If menstruating, test between days 19 to 21 days from the first day of your last period. What these tests will show you. These tests will show what condition your thyroid is in and how under attack it is from your own immune system (the TPO test). Your TPO may be low and yet you don’t respond to treatment, then you may want to ask for an ultra sound to check your thyroid for nodules. When iron, ferritin, Vit D, Vit B12 are too low, you can have problems absorbing thyroid hormone replacement. You need to get everything working well for your body to tolerate and utilize thyroid hormone medication properly. Cortisol levels are an adrenal hormone, which should be at the highest when you wake in the morning and gradually come down throughout the day. This helps you to sleep at night. Low or high cortisol can present a problem as well. Reproductive hormones also need to be balanced. 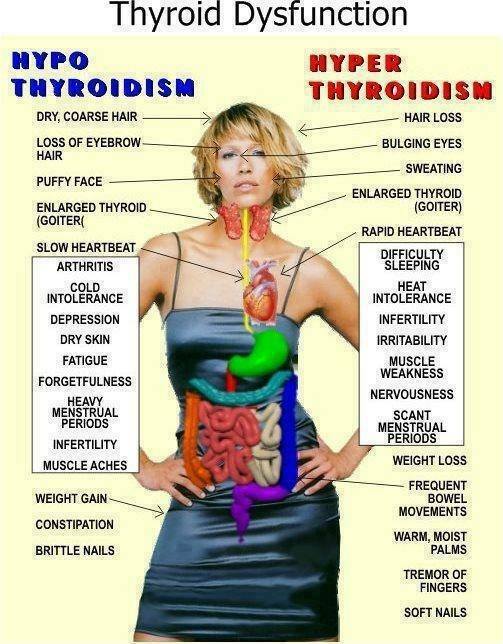 Your body needs a balance between Thyroid, Adrenal and Reproductive hormones. You often find that if one is out of balance, then they all are. My Doctor will only test TSH and then prescribe on that, what can I do? Firstly keep presenting the facts to the Doctor as to how you are feeling. I find the symptom list helpful as well as giving a full family history and I keep a diary as to each day, food, medications and how I feel. Doctors use the TSH test (Thyroid Stimulating Hormone) as it is the pituitary hormone that sends thyroid stimulating hormone to the thyroid gland to ‘get to work’. The TSH test is the “Gold” test for the NHS but it only shows what TSH you have in your blood stream and not what thyroid hormones you have in your cells, which is where you need it to be. Unfortunately there is no test for this. Approx 20,000 thyroid patients seek endocrinologist help each year in the UK because they don’t feel better and you need to find one that will listen to your symptoms and not rely on the blood tests.. The best way to determine your thyroid hormone levels are the Free T3 and Free T4 tests. That is the actual circulating thyroid hormone available for cellular use. If your Dr won’t listen to how you ‘feel’ rather than the blood test results, then it is time to find another Dr. I saw 5 and 2 endocrinologists before I finally found my answers. What is the difference between T4/T3 and Free T4/ T3? Thyroid hormones are in 4 parts. T4 is produced by the thyroid and is an inactive hormone. It becomes active in your liver when it is broken down into T3, T2 and T1. These totals are the hormone bound to proteins in the blood. The free hormones are the unbound hormone circulating and available for use by your cells. These are the results that will help in your diagnosis. Remember you are an individual and thyroid labs can only reveal so much! For some people normal is the top of the range, for some the bottom – remember its how you feel. In the UK each NHS region may have their own range to work in which adds into the difficulty in geting the right treatment and diagnosis. Vit B12 – 500 – 2000 pg/mL should be the target range, I find 900 is best for me. Always ask for copies of any blood test results to keep for yourself. These will also show the ranges used by your Dr. I find that the best time is early morning before I take my thyroid medications for the day. If you have just taken them, then the results will be off! Once you start getting tested then try to stick to the same time of the day for all subsequent tests to help give you a base line. Again, always ask for a copy of your results as knowledge is very important when dealing with your Doctor or endocrinologist. What Thyroid Medications are there? The NHS typically uses levothyroxine ( a synthetic T4) which takes up to 6 weeks to be fully used by your body and you may feel a bit worse at first as your body adapts to it. Some people do not respond well to levothyroxine and if you find that you start going on a roller coaster of getting better, then worse, so the Doctor increases, so you feel better, then worse so the Doctor increases. It’s time to step off the roller coaster and ask for more help. If getting off the rollercoaster it may mean you have a conversion problem of T4 into active T3, so these medications may be helpful. Your Doctor will advise when you should take them, but again you are an individual and people often find a better time for themselves. I take a lot of vitamins and here is my list. Again it is down to your own personal preference but I will take you through mine and why. Vitamin C – a good antioxidant that helps to balance your body. Don’t take at same time as iron supplements. Calcium and Vitamin D3 – D3 helps with pain relief. Do not take these within 4 hours of a thyroid medication. Nutri Adrenal supplements – to support my adrenal glands. Protein powder in my morning juice – this supports my adrenal glands. I also have vitamin B12 injections as a side symptom with my thyroid is pernicious anemia. I have become gluten free and also sugar free as it helps my whole body. Here is a link to a page about good foods for thyroid patients. I have always been a bit of an adrenaline junkie going off dancing for hours. Days even. I also loved driving fast cars and scary roller coasters. Now for my health and to keep my body calm I prefer yoga and walks in the countryside or by the sea. The fresh air is good for me as it helps to combat the intolerance I have to electricity. Exercise is important and should be under taken at a slow pace, when you feel ready for it. Remember there is no substitute for Good medical advice so please seek it. This information has been gathered through my own trials and research and is not a replacement for medical assistance.